The sound of an apparent explosion can be heard on the flight recorder of the Russian-operated plane that came down over the Sinai peninsula, killing all 224 people on board, adding to mounting evidence that a bomb was smuggled aboard, French media sources said on Friday. Giving further credence to the idea that the plane crash was a terrorist act rather than because of structural failure, Russia, which for a week has been resistant to speculation about a bomb, suspended flights to all Egyptian airports. An Egyptian-led international team of aviation experts, including some from France, successfully recovered the black box, the flight recorder, from the crash site. Several French media outlets, including the television station France 2, reported that the investigators had listened to it and concluded that a bomb had detonated, which would seem to rule out structural failure or pilot error. The pilots can be heard chatting normally, including contact with airport controllers, up until the apparent explosion. One source close to the investigation told AFP that the black box data “strongly favours” this theory. While another source reportedly said: “Everything was normal during the flight, absolutely normal, and suddenly there was nothing,” adding that the plane had suffered “a violent, sudden,” end. A news conference is due to be held on Saturday afternoon by the Egyptian aviation minister, Hossam Kamal, and the head of the Egypt-led investigation into the disaster, although the government warned it could be delayed. 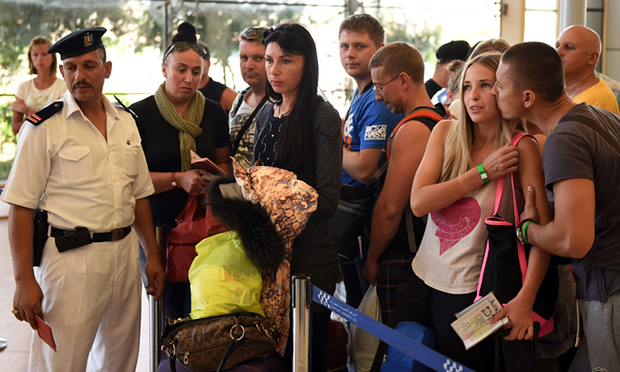 The reports about the black box contents came as British attempts to bring passengers home from Sharm el-Sheikh descended into chaos on Friday. 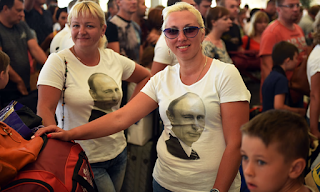 While Russia had earlier suggested that the UK was acting prematurely in halting flights to the Red Sea resort over terrorism fears, Vladimir Putin ordered even wider restrictions on Friday, including halting all flights from Cairo. The head of his federal security services said it would be expedient to suspend flights until they had discovered why the Airbus A321 had crashed last Saturday. Meanwhile, the US announced new security measures – including tighter screening – for flights from some airports in the Middle East. Jeh Johnson, the homeland security secretary, said that the move was motivated by “an abundance of caution”. Russia initially dismissed claims by Islamic State of responsibility for downing the Metrojet flight, which came weeks after threats of retaliation for Russian planes bombing Syria, and Moscow reacted angrily after David Cameron said it was “more likely than not” a bomb. Suspicions have intensified throughout the week that the Metrojet airliner was blown up, with French media reporting on Friday that an explosion was audible on the black box recordings. French experts from Airbus are part of the investigating team. According to reports from the US, a “flash” from the plane was picked up by US satellites, pointing to an explosion. American officials have also told Reuters that intercepted intelligence “chatter” involving militant groups in Sinai supported the bomb theory. An Isis-affiliated group has claimed three times that it was responsible for bringing down the plane. Russia will now begin to bring home its tourists, up to 79,000 of whom are currently on holiday in Egypt, according to Russian tourist authorities. However, there were chaotic scenes at Sharm el-Sheikh airport on Friday as the schedule of “rescue flights” apparently agreed by airlines disintegrated. Thousands of travellers who had gone to the airport expecting to leave were further delayed. Eight easyJet flights were cancelled in the morning, while empty Monarch, Thomas Cook and Thomson airliners that had flown from Britain to bring back holidaymakers were diverted before reaching Egypt. Tour operators promised that stranded customers would remain in their accommodation free of charge or be reimbursed. Egypt’s civil aviation ministry denied that it was blocking any flights, but said only eight of the 29 planned flights from Sharm el-Sheikh to the UK on Friday were operating because the airport did not have the capacity to store hold luggage. Only hand luggage is being allowed on flights back to Britain amid fears that a bomb was placed in the hold of the Metrojet plane. Britain had expected that all passengers who were due to fly home this week before flights were cancelled over security fears – about 3,500 people – would have returned by Friday night. Patrick McLoughlin, the transport secretary, had told the BBC: “We feel that should be possible.” But as the day unfolded, a Downing Street spokesman said the situation was “very fluid … complicated and difficult”. He said a broken-down aircraft at the airport had contributed to delays on the ground. The first 180 tourists to return to the UK arrived at Gatwick airport on an easyJet flight at 4.25pm, describing chaotic scenes before departure. They said the pilot had assured them that intelligence officials from MI5 and the Egyptian army had guarded their plane before takeoff to ensure its safety. A further 179 passengers were on board a second easyJet plane that landed at 5.30pm at Luton. A number of the cancelled UK –bound flights were expected to operate on Saturday, while the hold luggage of returning British passengers would be transported on separate flights over the next 10 days. While Egypt said the decision to cancel the majority of UK-bound flights on Friday was purely logistical, an easyJet spokesman suggested it was a political decision after Britain took a lead in restricting travel. Egypt has rejected claims that Isis carried out the attack and maintains there is nothing wrong with security at Sharm el-Sheikh airport. The country stands to lose a large, critical source of income in the region if the tourist industry is in effect shut down because of terrorism fears.